The dimensional stability that Diamond Core SPC tiles have demonstrated is four times better than other luxury vinyl tiles. The rigid core of the tile makes it impact and indentation resistant, which means that it can be installed anywhere indoors and is even suitable for rooms with underfloor heating (request instructions prior to installing), making it an excellent choice for the home or the office. Being both heat resistant and 100% waterproof makes the product ideal for any area of a building –from kitchens to sunrooms. No acclimatisation is needed to allow for expansion or contraction from the factory floor and zero changes will take place if the tiles are exposed to direct sunlight. SPC flooring can withstand temperature differences from -3℃ up to 50℃, making Diamond Core flooring a great option for anywhere in South Africa. The rigidity of the tile can be attributed to its high-density limestone-based composite core. No subfloor preparation is needed and the tiles can be installed over any surface without showing telegraphing of imperfections below. Diamond Core SPC also has enhanced protection against scuffs and abrasions with its tough, transparent wear layer with an enhanced PUR overlay finish. It is both high-density and extremely durable. The strong and easy to join 4-sided locking system make the tiles easy to install. Diamond Core SPC boasts a locking pull strength of 500 kg/lin.m and can be installed much faster than those tiles using traditional click systems subfloor. Diamond Core planks are longer and wider than most other systems in keeping with a modern trend in flooring that has become popular across the globe. Rich surface textures and high definition visuals also contribute to the natural appearance of the tiles, and the Premium Attached IXPE underlayment improves sound absorption and thereby the auditory environment of a space. The product has been certified as 100% recyclable and 100% plasticiser-free. It also inhibits the growth of surface mould and mildew while discouraging the growth of hidden mould beneath the floor, making it safer for building occupants by improving the air quality. Formaldehyde isn’t used in the manufacturing process and the vinyl planks are fire retardant. Owing to its amazing performance under huge variations in temperature and humidity, SPC has gained popularity across Southeast Asia, Latin America and parts of Africa. 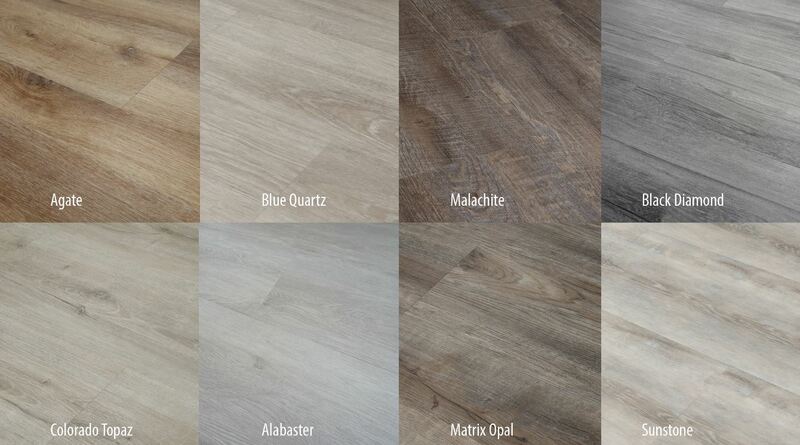 Diamond Core luxury vinyl tiles boast superior stain, fade and wear resistance whilst combining the beauty of hardwood, the durability of LVT and the ease of click installation. Diamond Core flooring is ideal for retail, hospitality, corporate, educational, and residential environments.